Custom, strand-by-strand placement for your most perfect brows. Microblading is art, creating ultra-fine, natural-looking hairstrokes for a thicker, fuller, and more perfect brow. This cosmetic procedure, different from tattoo, is a manual method of creating semi-permanent (to permanent) eyebrows. The pigment will fade slowly over 18-24 months, depending on your skin type, skin care regimen, and sun exposure. Book your free consultation today and find out if Microblading is right for you. Every face is unique and every "perfect brow" is just a little bit different. We build the best brow for you. No stencils. Ever. 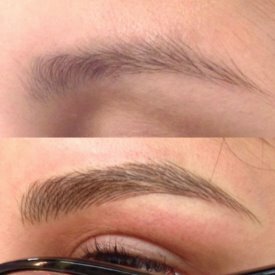 We offer four different blading and shading techniques so you can achieve the best brow style for your lifestyle. Elizabeth Loennborn has over 20 years experience in makeup artistry, bringing her extensive knowledge to this new art form.